July 30, 2006: One major reason for the increased Taliban this year was the wholesale replacement of a lot of Taliban field commanders last Fall. With new money coming in last year (from drug gangs and rich fans of Islamic radicalism), there were also calls for some more energetic leadership in the field. At that point, the pre-2001 Taliban leadership was still calling most of the shots, and they had not done very well over the last four years. So it was agreed, that the time had come to let the younger guys, with new ideas and new energy, to take over.The new crew certainly shook things up. More than three times as many Taliban were killed in action this year, and even more were captured, compared to last year. But the new Taliban activity has had an impact. Over 200,000 children have been shut out of school. The Taliban does not approve of non-religious schools, or schools that teach girls. Dozens of government officials (including school teachers) have been murdered, and many more threatened. Relief supplies, for drought victims, were blocked (because they were provided by infidels). Same deal with many reconstruction projects.But the energetic new leaders have failed in one important area; popularity. Afghans don’t like being terrorized, or their kids driven from school, or relief supplies held up. It’s going to be a long, cold Winter. U.S.-led coalition forces and Afghan police killed 20 suspected Taliban in the latest fighting to hit southern Afghanistan, as NATO on Sunday prepared to take command in the insurgency-wracked region. Afghan forces also killed six militants in southeastern Paktika province, an Afghan official said. On Monday, the U.S. anti-terror coalition is to formally hand over control of security operations to a NATO-led force that has deployed about 8,000 mostly British, Canadian and Dutch troops in the south. The deployment has coincided with the deadliest upsurge in fighting since U.S.-backed forces ousted the Taliban regime in late 2001 for hosting Osama bin Laden, mastermind of the Sept. 11, 2001, attacks. On a visit to Afghanistan on Sunday, French Defense Minister Michele Alliot-Marie said many Taliban fighters were crossing from Pakistan to stage attacks. “We need real cooperation from Pakistan, but it seems very difficult for them. The border is a very difficult region and we ask Pakistan to make some more effort to control it,” she told reporters in Kabul. Pakistan, a key U.S. ally in its war on terrorism, says it does all it can to patrol the porous Afghan border. On Saturday, a joint force of coalition and Afghan troops killed 20 suspected Taliban militants who had attempted an ambush in Shahidi Hassas district of Uruzgan province, a coalition statement said. There were no casualties among coalition or Afghan forces. Afghan soldiers and police killed six Taliban fighters and captured eight Sunday during a clash in southeastern Paktika province’s Waza Khwa district, said Said Jamal, spokesman for the provincial governor. No further details were available. In Kandahar province, three militants blew themselves up Saturday as they laid an explosive on a road, said Daoud Ahmadi, a spokesman for the provincial governor. Another suspected Taliban died Sunday when a land mine he was planting north of Kandahar city exploded, Ahmadi said. Taliban-led fighters have escalated roadside bombings and suicide attacks this year, and have also mounted brazen attacks on several small towns and district police stations — a tactic rarely seen in the previous four years. International forces, backed by the Afghan army, have meted out a tough response. Afghan Defense Ministry spokesman Gen. Zahir Azimi said a 50-day operation dubbed Mountain Thrust has resulted in the deaths of at least 613 suspected militants. Some 87 others were wounded and about 300 arrested, he said. Azimi said between 13 and 16 civilians had also died. Taiwan Plan to Test Fire Missile? TAIPEI, TAIWAN – As Asia grapples with the fallout from North Korea’s projectile posturing, another military flashpoint in the region – the Taiwan Strait – is in the midst of missile tensions as well. A private TV station reported earlier this month that Taiwan’s military was preparing to test-fire a tactical missile in September capable of striking targets in China. While the details were sketchy and the claim was swiftly denied by the Ministry of National Defense, they struck a chord with analysts who have heeded the frustration among hawks in Taiwan over the island’s vulnerability in the face of China’s military might, including its expanding missile arsenal. May I go on record as saying that this is a highly, extremely, very bad idea … until, that is, Taiwan can give proof of its already having gone nuclear. If Taiwan goes nuclear, they have protection against Chinese bully tactics. If they don’t, this missile will be seen as nothing more than an instigation to conflict — a conflict that Taiwan will lose. BAGHDAD, Iraq — A U.S. plane launched an airstrike today against a building used by al-Qaida in Iraq, killing two militants, the U.S. military said. A car bomb exploded near the U.S. consulate in Kirkuk, killing two Iraqis and wounding seven others, Iraqi police said. Four suspects were detained after the air attack, which took place southwest of Baghdad against extremists who had been staging mortar attacks on civilians, a U.S. statement said. U.S. troops tracked the militants to a building and “coalition aircraft successfully executed the strike,” the statement said. These are the same people who are believed to have launched a mortar attack recently that killed more than 30 people. BAGHDAD, Iraq – Four U.S. Marines were killed in combat in western Iraq’s Anbar province, the U.S. military said Sunday. The Marines, who were assigned to the Regimental Combat Team 7, died on Saturday. Their identities were not released. They died in the western province that is a focal point of the Sunni-dominated insurgency. Will I make it through my son’s deployment? Pray for their families tonight. Some 150 rockets were fired from the Lebanese village of Qana over the past 20 days, Air Force Chief of Staff Brig.-Gen. Amir Eshel said on Sunday evening. Speaking to reporters, Eshel added that Hizbullah rocket launchers were hidden in civilian buildings in the village. He proceeded to show video footage of rocket launchers being driven into the village following launches. Eshel also pointed out that the building was hit sometime around midnight Saturday night and didn’t collapse until about 8 a.m. Sunday morning, leaving an unusual gap in the timing of the events which the IDF was investigating. THIS is the picture that damns Hezbollah. 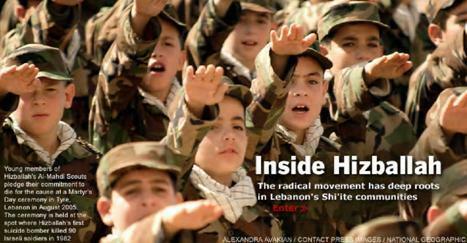 It is one of several, smuggled from behind Lebanon’s battle lines, showing that Hezbollah is waging war amid suburbia. In every area — from firing rockets to defending prepared positions… — we have examples of Hezbollah teams deciding, adapting, innovating, and collaborating without reference to any central authority. The result of this decentralization is that Hezbollah’s aggregate decision cycles are faster and qualitatively better than those of their Israeli counterparts… the continued success of its efforts has put the Israelis on the horns of a dilemma: either request a ceasefire or push for a full invasion of southern Lebanon (each fraught with disastrous consequences). Contrary to much of the chatter about how the dynamic developing (sic) –of Hezbollah essentially fighting Israel to a statement (and thus effectively winning)–that really shouldn’t be a surprise. Fighting a counter-guerilla campaign has never worked well from the air, nor have efforts to bomb people into submission. But that’s all (recent) history. The question is what should Israel do now. And honestly, I’m just not sure. Well, I am sure of several things. First of all, I would slightly modify Defense Tech’s assessment by saying that while a full scale invation has potential disastrous consequences, requesting a ceasefire brings certain disastrous consequences. Second, this trouble could have been partially mitigated, if not completely abated, with the deployment of directed energy weapons (Tactical High Energy Laser). Katyusha multiple rocket launchers were first fielded by the Soviets during World War II. They fire a primitive, short-range unguided rocket that is not very accurate. They have only limited military utility but are perfect for terror. Hezbollah has a vast stockpile of Katyushas. Israel, meanwhile, expressed “deep regret” for the deaths and said it would investigate the bombing, which drew widespread international condemnation. “Israel deeply regrets, is greatly saddened, by this attack on innocent civilians in Lebanon. Israel takes full responsibility and is going to start an open investigation to find out how this happened,” government spokeswoman Miri Eisin said. This is not helpful. Of course, since there is no strategic value to killing children, this was accidental. But look for it to be spinned the other way in the Muslim world. At one point in time, during WWII for example, when bombs were “dumb” and could not be guided, civilian deaths were part of destroying the industrial infrastructure of a country in order to stop its ability to wage war. Even if unintentional, there were still civilian deaths. Attempting to keep non-combatants out of the way of harm is part of “just war theory.” Now with smart, stand-off weapons, the bar has been raised, so to speak. It is now the case that each and every time a civilian dies, there is condemnation since the expectation is perfection. Compare and contrast that with the rockets being sent into Israel by Hezbollah. See a difference in the world’s expectations? We should have none of this about Hezbollah using the only weapons to which they have access. The fact still remains that just war theory prevents, to the degree we are able, the deaths of non-combatants. Hezbollah doesn’t do this, while Israel begins an investigation to assess their failure in this incident. Ramadi, June 29, (VOI) – U.S forces have blocked all roads leading to the restive Iraqi town of Ramadi and stopped people from leaving or entering the town, eyewitnesses reported on Thursday. The forces set up checkpoints and placed concrete blocks on the outskirts of Ramadi, Anbar University employees told the independent news agency Voices of Iraq (VOI). Residents fleeing homes in Ramadi reported on Wednesday that the central Aziziya neighborhood came under shelling by U.S. artillery. Some houses were demolished but there were no reports of casualties. Ramadi has recently witnessed an escalation in military operations by U.S. and Iraqi troops, forcing more families to flee the town to Falluja, Heet, Haditha and Rawa. Things Heating up in Ramadi? July 27, 2006: There was a major embarrassment at the CIA when it was discovered that Italian detectives had been able to identify and track some CIA agents because the agents had used a frequent flyer card to travel around Europe. That card provided enough information for the Italians to identify the CIA men as CIA employees. Nice guys. Very subtle. What should I file this post under? Intelligence? Is Israel’s political leadership refusing to win in Lebanon? It has only been two weeks since the start of the counter-offensive against Hizbullah terror, and already Israel’s government is rejecting the military’s professional recommendations for how to achieve victory. At a meeting held late into the night on Wednesday, Israel’s security cabinet denied the army’s request to launch a more expansive ground operation in southern Lebanon with the aim of clearing the area entirely of Hizbullah’s terrorist infrastructure. Instead, the cabinet prefers to continue using airpower combined with pinprick ground incursions against select Hizbullah targets. The result, of course, has been that Hizbullah continues to succeed in firing some 100 rockets each day into Israel. Because they do not face a concerted Israeli ground offensive, Hizbullah does not have to throw everything it has into fighting off the Israeli army. Consequently, they can deploy men and resources to shoot rockets into northern Israel with the aim of terrorizing the country. Don’t get me wrong – a ground offensive aimed at carving out a security zone in southern Lebanon would not be simple or risk-free. But Israel’s limited operations thus far have failed to stop the attacks, and the army’s experts are saying that the only way to do so over the long-term is to go in full force. In the mean time, Nasrallah has leveled more threats at Israel, and Condi is in Israel selling the idea of an international intervention force (Condi – “There will have to be give and take”). Each and every time the UN has been involved in such a thing, an apology has to be issued later. The UN is inept and impotent, so the force would likely have to be NATO. They will eventually get tired of seeing their troops get blown up, and Hezbollah will certainly not back down from NATO troops. Get ready for suicide bombers, rockets and IEDs in southern Lebanon. Haifa still sees missiles every day, and the IDF lost 18 troops trying to clear out Bint Jbail, and they have pulled out of Bint Jbail saying that they have accomplished what they wanted. I don’t know. It sort of makes me shake my head and wonder.